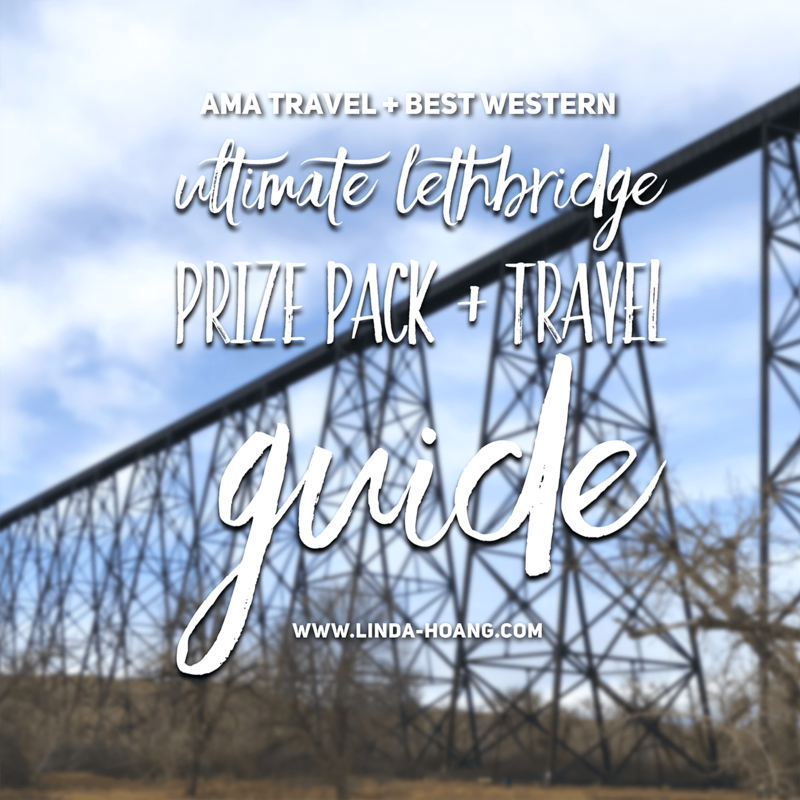 Keep scrolling to read where to eat, what to do and where to stay in Lethbridge, Alberta, and for details on how to enter to win an Ultimate Lethbridge Prize Pack courtesy of my friends at AMA Travel and Best Western! Note: This post was sponsored by AMA Travel and Best Western. AMA Members save up to 15% on Best Western stays in Canada, the U.S., and worldwide. Your AMA Membership can save you—whether you need roadside assistance, to book a vacation, or at one of their Reward partners. Check out amatravel.ca/bwbloggers to find out more and see the adventures other bloggers went on! Pin + Share my Ultimate Lethbridge Prize Pack Giveaway + Travel Guide. Lethbridge, Alberta has some awesome eats! I’d recommend a visit to one of their local breweries—they’ve got two, and we loved the one we tried: Coulee Brew Co. The space is huge—16,000 sq. ft, including its brew pub, which has a great menu featuring dishes like pork craklin, burgers, wings, nachos, pizza and more! I was impressed with how diverse the menu was—the types of food was what you’d expect at a pub, but there was cacio e pepe pizza (Italy), tuna poke tacos (Hawaii), banh mi sandwich (Vietnamese), Seoul Bowl (technically with poke, it’s also Hawaiian but the Seoul title makes you think of Korea). They also have kids and late night food menus! 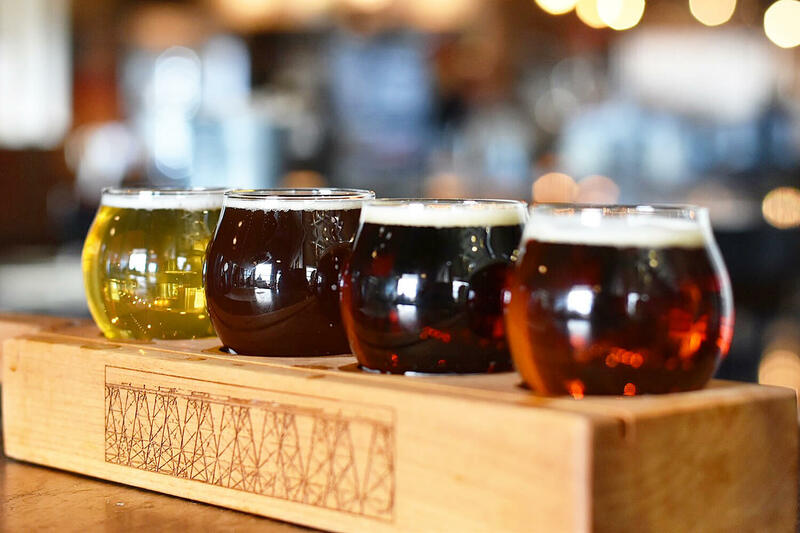 A flight to sample the different brews at Coulee Brew Co. in Lethbridge! The Tasting Board we had was whatever basically Chef’s Special for the day, which happened to be delicious tacos. Paired with a flight of their Range Road ream Ale, Bears Hump Nut Brown, Red Coat Amber Trail Ale and Quarter Pound Kilt, plus their sheet pan nachos featuring really tasty house-fried tortilla chips (and we added brisket). Overall it was a solid meal and the drinks were all enjoyable, we ended up buying some packs to take home too! Our delicious spread at Coulee Brew Co! Bonus Fun Fact: Coulee Brew Co. is named after the coulees all over and around Lethbridge. Coulees are dried up glacial river valleys surrounded by hill peaks. Coulee Brew Co. itself has a lot of cool reclaimed wood and other pieces in their building made from different pieces of Lethbridge’s history. It was neat to read (they have the stories on each table). A delicious half and half pizza from Two Guys & A Pizza Place in Lethbridge. Our favourite meal in Lethbridge though was at Two Guys & A Pizza Place, a delicious pizza joint that’s been a mainstay in the city for over 16 years. 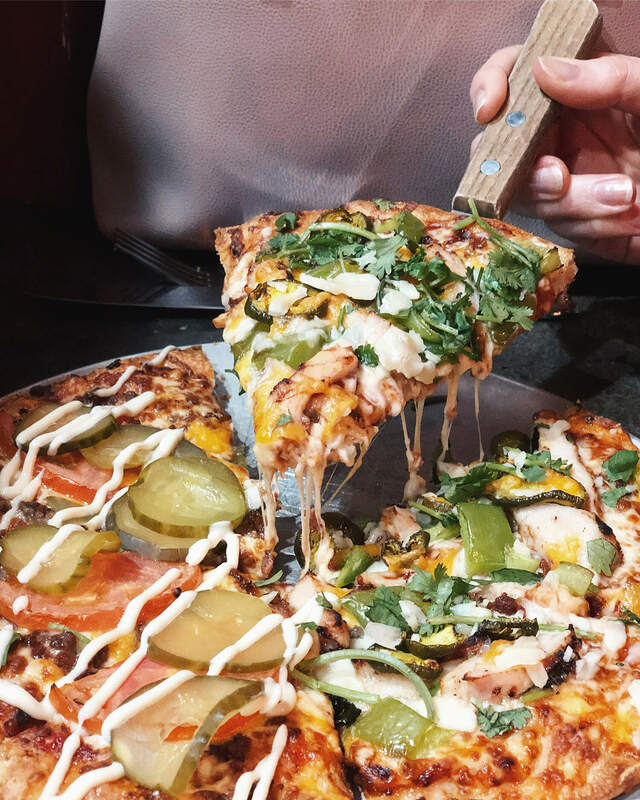 It was featured in an episode of the Food Network’s You Gotta Eat Here, and offers over 40 kinds of pizza, including a few that have been named Canada’s Best!! There are a lot of really interesting topping and sauce combinations at Two Guys & A Pizza Place, and Vanessa and I were excited to try a bunch. You can get half and half pizzas so that allowed us to try four different kinds: The Cheeseburger (original pizza sauce, beef, bacon, tomatoes, pickles, cheddar and a mayo swirl), Louisiana Cajun Chicken (creamy Cajun sauce, chicken, bacon, jalapeños, green peppers, monterey and cheddar cheese, fresh cilantro and parmesan—named Canada’s Best Pizza in 2012), The Italian Club (basil pesto, capicola, pancetta, provolone, onions, tomatoes, arugula, parmesan and balsamic—5th Place at the International Pizza Challenge in 2012), and the Pizza Quattro Stagioni (pizza sauce, capicola, ricotta, artichokes, mushrooms, olives, parmesan and honey). I drool thinking about these pizzas! I love when toppings just come together to create amazing flavours. The Louisiana Cajun Chicken, Cheeseburger and Pizza Quattro Stagioni were my favourites. The Italian Club was good but not my favourite (I think because I don’t love balsamic). As I write this, I literally wish I could be back in Lethbridge to eat this pizza. Ugh. They brush garlic butter on the crust too so you’re definitely going to eat every single bite of these pizzas. Delicious! The place is bustling on a Saturday night at 6 p.m., so there was a bit of wait for food, but the pizza was worth every second of the wait. Inside Sonder Coffee in Lethbridge, Alberta. And although not formally part of our weekend itinerary, we were recommend to visit Sonder Coffee too, so we stopped by for some drinks (peppermint tea and matcha latte) before we headed back to Edmonton on Sunday. The place was clearly popular, packed. 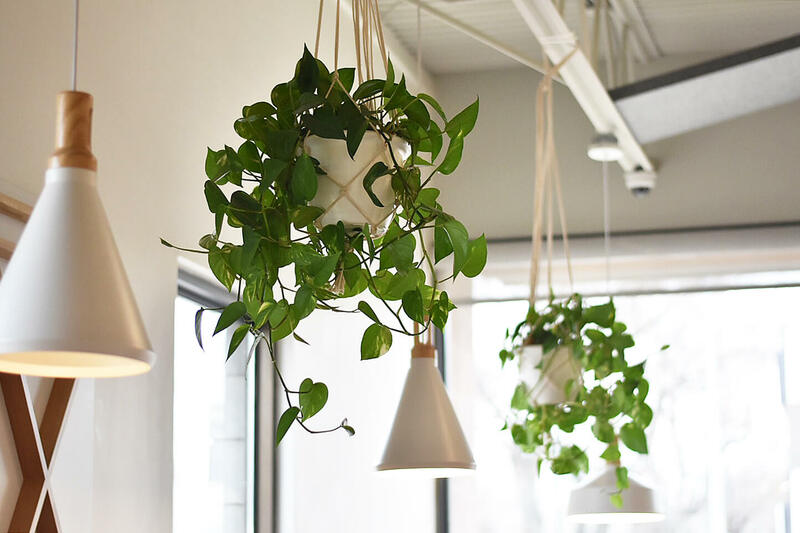 It reminded us of a lot of the trendy coffee shops in Edmonton with its clean interior, white walls, wooden tables, bursts of green plants. Beyond drinks, Sonder is known for their liege waffles, and on Sunday’s, they offer an Eggs Benedict for brunch. It was a really cute place (though, did have slower service when we went). Obviously our whirlwind trip to Lethbridge didn’t afford us the time to try all of Lethbridge’s great eats. We were curious to try their Water Tower Grill, which is a restaurant located literally inside the city’s former water tower. And there were a few other spots tweeted to us that I’d love to try again on a return visit. We took Olive on a morning stroll along the gorgeous Henderson Lake in Lethrbidge. It’s a 24-hectare man-made lake with huge old trees, groves, a bunch of benches, walking trail, playground and pathways. It’s popular for kayaks, canoes and paddle boats, and also popular for fishing (there was a guy fishing when we walked by, and a bench near him that was dedicated to a man who used to watch his son fish). That was really peaceful. We passed joggers and dogs along the paths, and not too far from Henderson Lake is the Nikka Yuko Japanese Garden, which unfortunately was closed when we went (preparing for winter lights festival), but I’m told is also a must-visit in Lethbridge. Fishing at Henderson Lake in Lethbridge, Alberta. I’m a huge fan of escape rooms, so AMA Travel arranged an escape room experience as part of our visit. We tried to escape a super hero-themed room from Escape from LA. We didn’t escape, but we had lots of fun! I thought the storyline fit nicely with the puzzles, and there were quite a few puzzles to solve which kept us pretty busy for the full hour experience. Bonus Fun Fact: There are a few different nicknames for Lethbridge, including ‘LA’ (Lethbridge, Alberta) and Bridge City. Glow-in-the-dark bowling at Galaxy Bowling Lethbridge. We also hit the bowling lanes at Galaxy Bowling and Pizza, where I discovered I’m pretty much a pro at 10-pin bowling lol. (However, I am terrible at five-pin bowling lol). Friday and Saturday night is their “Cosmic Bowling” so the building goes dark with disco balls and multi-coloured LED lights. It also proved to be a popular place to be in Lethbridge! 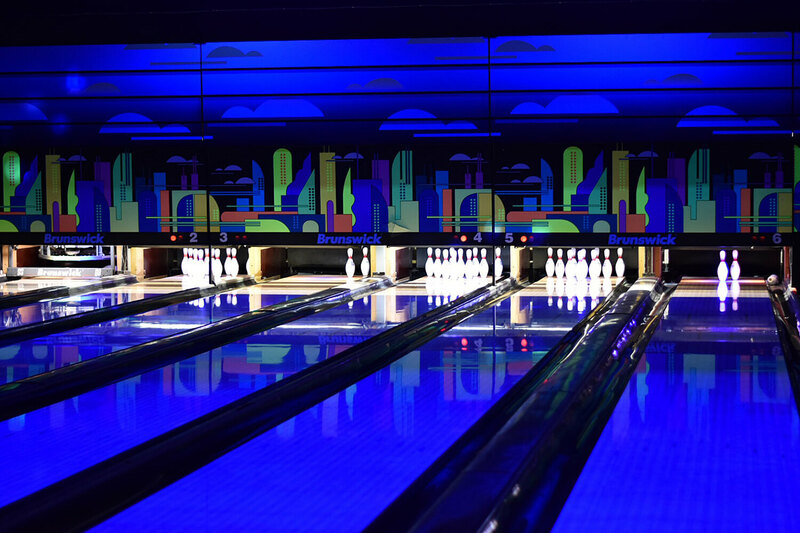 Bonus Fun Fact: AMA Members save 20% on regular open play rates at Bowl Alberta lanes? We met this cutie pie at the Paw Time Indoor Dog Park in Lethbridge. There’s also a doggy daycare, indoor dog park / stay & play in Lethbridge called Paw Time Indoor Dog Park! We stopped to let Olive run around here (it was her weekend getaway too! 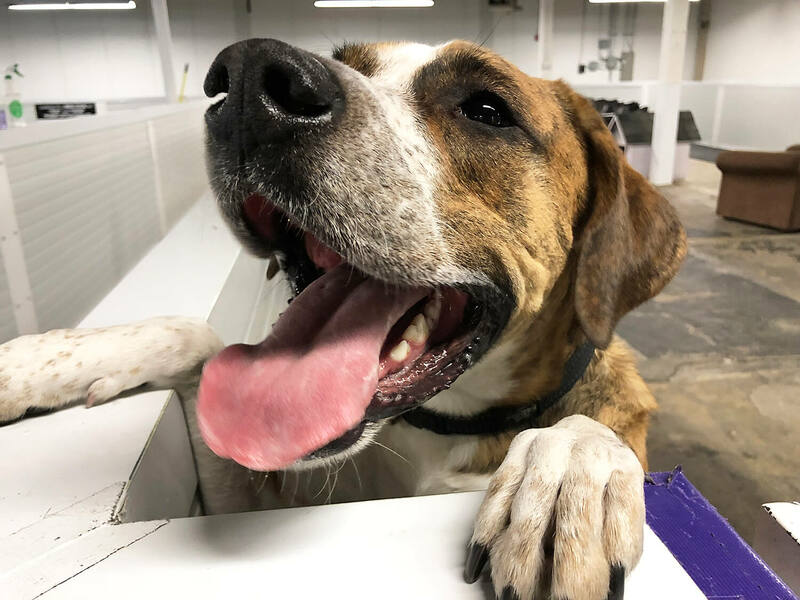 lol) Paw Time does local dog daycare but increasingly, I’ve noticed dog daycares offering service to out-of-town guests who are traveling with their dogs too! It’s definitely convenient, but I was a bit of helicopter dog mom and didn’t want to leave her there (she’s never been to dog daycare before lol) Though, in the course of the hour we hung out—a ton of paw-rents did come by to drop of their dogs, it was definitely a paw-pular place! Okay, I’ll stop with the dog puns lol. 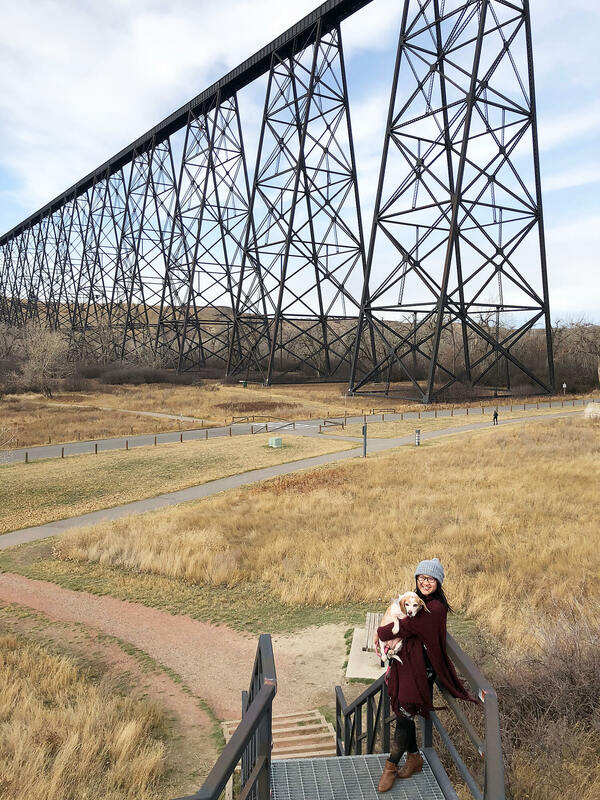 Olive and I at the famous Lethbridge Viaduct (High Level Bridge)! And of course, we couldn’t visit Lethbridge without visiting their famous bridge! The Lethbridge Viaduct or High Level Bridge, is the longest and highest trestle bridge in the world, originally built in the early 1900s. It is 1,600 m long and 95 m high nestled between the coulees, and built to withstand violent winds. The bridge is not just a historical landmark, but the rail line is still used today, with trains crossing it every single day. You can get some great views of the bridge if you head to the Helen Schuler Nature Centre. The whole area is nice to walk too. When we took Olive around, we saw a few joggers and other dog walkers! 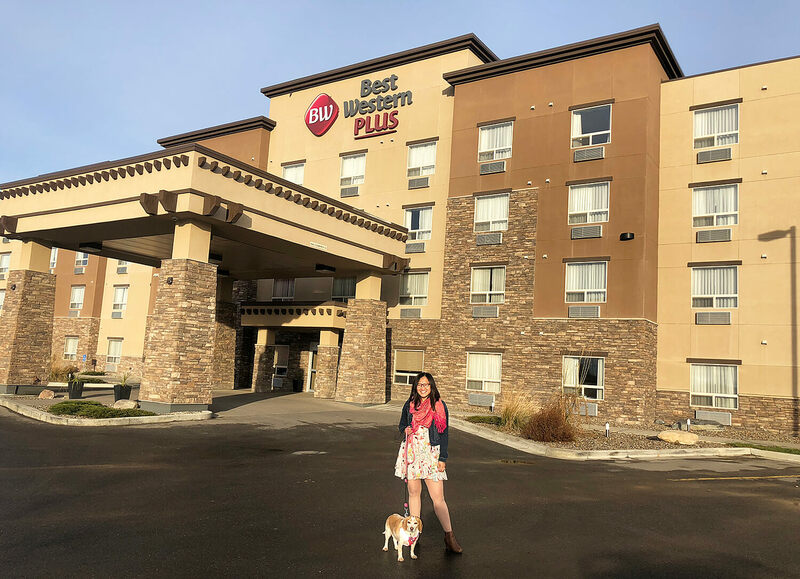 You’ll probably be able to guess where I’m recommending you stay while in Lethbridge: Best Western Plus Service Inn & Suites! This hotel is the newest one in Lethbridge (at the time of writing this, November 2018). This Best Western Plus is conveniently located next to Coulee Brew Co. (walking distance!) 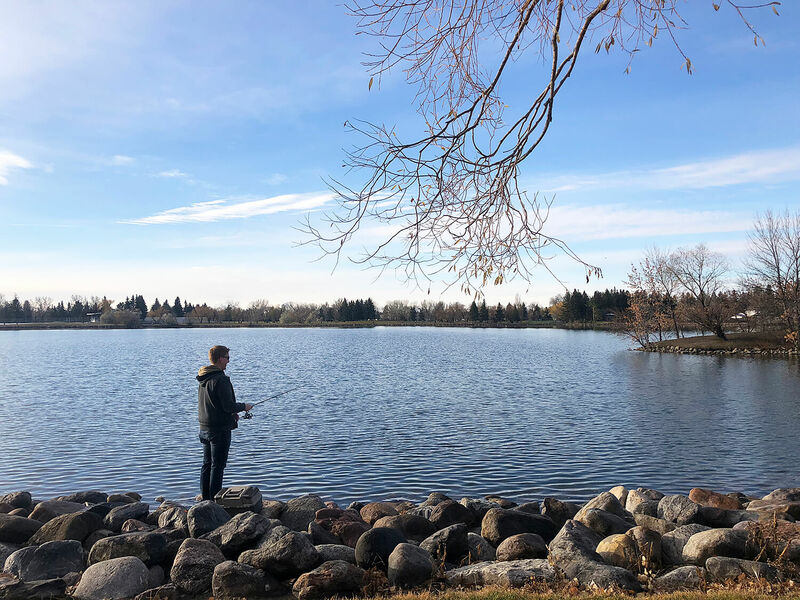 and just a short drive from everywhere else you’ll want to explore in Lethbridge (literally it felt like everywhere we went in Lethbridge was within a 5-8 minute drive from one another, it’s a really convenient small city). Our Best Western room was conveniently located so I could give Olive quick walks! We loved the complimentary HOT breakfast at Best Western Plus! Hot breakfast makes such a difference (I’m not really a continental breakfast kind of person. That’s not breakfast to me lol). Breakfast bacon, sausage, and hash browns to stay, and a banana nut or apple cranberry muffin to go was the perfect way to start both of our mornings in Lethbridge. There’s a 24-hour gym if you’re one of those people who work out on your vacations (lol), the pool has a hot tub and waterslides, the room has a mini fridge (to keep your leftovers from all your eatin’ adventures!) and the hotel is pet friendly! 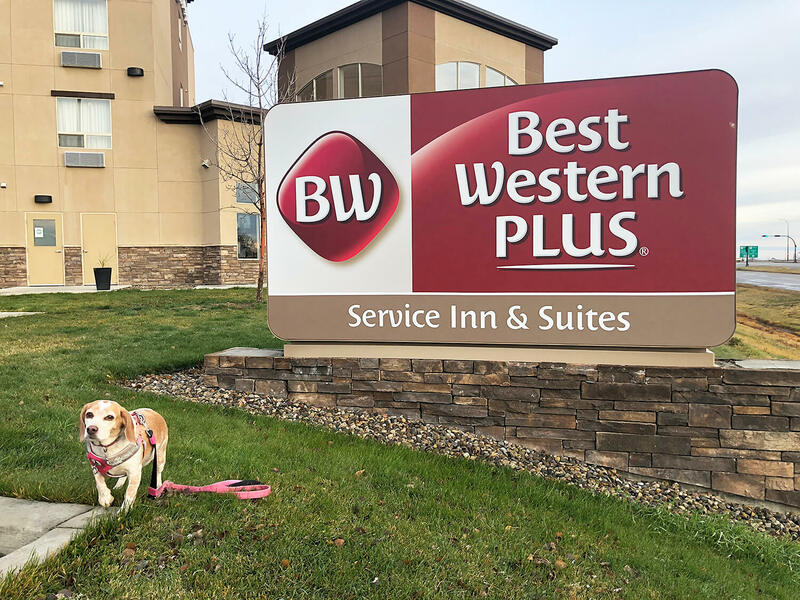 Olive enjoyed her stay at the pet-friendly Best Western Plus in Lethbridge! In fact, all Best Western hotels are pet friendly! That meant we could bring my cutie Olive with us on our weekend adventure. Even more convenient? We were able to get a room on the main floor, just steps away from the front or side doors, so I could quickly pop in and out to walk Olive whenever I needed to. Super. Convenient! Did You Know: AMA members save up to 15% on room rates at Best Western Hotels in the U.S., Canada, and around the world? And you can keep the savings coming by signing up to the Best Western Rewards Loyalty Program. It’s free and easy to register, you just need to connect your AMA member number with your Best Western Rewards account and you’ll start earning points which you can use to redeem for stays at Best Western! Every $1 US spent = 10 Best Western Rewards points. The points don’t expire, and you can typically get room stays for about 20,000 points, however this varies depending on where you stay. Enter to Win the Ultimate Lethbridge Prize Pack! * The winner will need to sign up to become a free Best Western Rewards Member in order to use the 50,000 points. Points required per stay will vary depending on what location you choose. Bonus Fun Fact: AMA members can get reloadable Esso gas cards at any AMA centre. This will earn you 2% back in AMA reward dollars every time you purchase gas, car washes, or snacks at an Esso. An AMA Reward dollar is equal to $1 that can be spent on travel, movie tickets or memberships. Leave a comment on this blog post telling me you followed the three accounts on Instagram. You could also share what makes a good hotel stay for you on your comments here too! Note: comments are moderated so if your comment does not appear on the blog right away, don’t worry about it! Following me, AMA Travel and Best Western on Instagram, and leaving a comment on Instagram and this blog post is mandatory to enter. Leave a comment on my Facebook post, tagging a vacation buddy to spread the word about the giveaway! I will randomly select ONE winner from all entries received by Nov. 30, 2018. Good luck, and thank you to AMA Travel + Best Western for arranging such a great prize pack and a great travel experience! Disclaimer: This post was sponsored by AMA Travel and Best Western. AMA Members save up to 15% on Best Western stays in Canada, the U.S., and worldwide. Your AMA Membership can save you—whether you need roadside assistance, to book a vacation, or at one of their Reward partners. Check out amatravel.ca/bwbloggers to find out more and see the adventures other bloggers went on! Followed everything! What a fantastic giveaway!!! Entered all 3 accounts on Instagram. That pizza looks amazing! Thanks for the chance and I love reading your posts! I would love to explore Lethbridge with my husband and two dogs!! We are just starting to consider traveling with our pups! It’s quite terrifying. Thanks for all of the great tips. I definitely did all the steps and followed all the accounts on Instagram. For me the best hotels are reasonably priced, and have a ridiculously comfortable bed! Lethbridge is such a cool place, I love visiting the coulees and taking day trips to Waterton national park. This is a great giveaway and incentive to visit more of Alberta! I did not realize there was so much to see and do in Lethbridge! I followed all your steps needed. Thanks for the opportunity, love your blog. I look for a clean, quiet, well placed hotel experience. 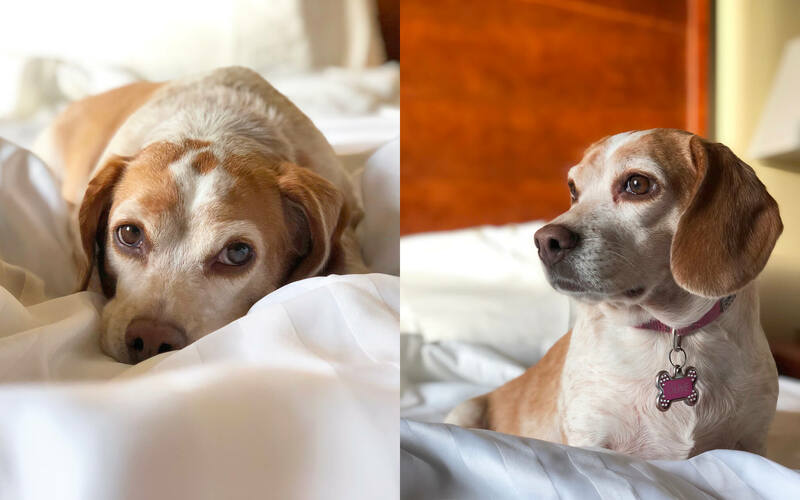 All three followed on IG and FB :) pet friendly hotels are a definite bonus!!! Sorry – cannot edit previous comment. I’ve also followed all three accounts on Twitter, Facebook, tweeted the phrase and left a comment on Facebook. Pretty sure that is all the bonus entries. Followed the steps and a comfortable bed also helps with a good night stay. Done everything. Pick me! Pick me! I would love to explore Lethbridge with my daughter. Followed all accounts! Love this giveaway. I travel to Lethbridge lots to visit family, but rarely leave their farm and explore the city. My favourite part about a hotel is the comfy bed. So much fun for a much needed mommy & daddy weekend getaway!! We like fun things, clean rooms, good rates, good pool and good eats! I followed all the steps. Liked all three instagrams and commented. Would love to win this. I went to University in Lethbridge years (decades) ago and havn’t been since. I’d love to visit Lethbridge and visit new family! I already followed the 3 accounts on Instagram! Comfort, clean spaces and friendly staff a must ! Lethbridge is such a lovely little city! Thanks for sharing its charm! I liked the three accounts on IG, and commented on your IG post. I look for good value, cleanliness, comfy bed, friendly staff and vicinity to my destination. I followed all three accounts and left a message on Instagram. I am so excited for the opportunity to explore this part of the province. I did all the steps. Just letting you know that the instagram link to AMA on this blog post currently goes to the wrong page. I followed all accounts on Instagram (@slice.of.fried.gold) Twitter (@dave209april) and Facebook (David Pyle), Tweeted and left a comment tagging a friend on the facebook post. Thanks! I look for cleanliness and inclusive breakfast. Thanks! This would be such a fun getaway! I’ve never been to Lethbridge and that pizza with pickles is calling my name!!! Definitely entered. Liked all accounts, following all accounts, tweeted the message all mandatory and bonus entries done. Thanks for the chance awesome contest would love a trip to Lethbridge have never been. I following all 3 instagrams follows. I prefer hotels that are dog friendly, I have a 6 pound Yorkie and she is so good with travelling with us and if we didn’t bring her along she would miss us to much. Also, I love pet friendly hotels because I like to stop and say hello to other pets, that’s just me. I stop to say hello every time. BW and AMA are musts for any road trip to go smoothly. Follow them both and of course you. I like all the accounts on instagram as @edmontonjb and I commented on your IG post. I love when a hotel has nice bedding and a mini fridge in the room. We have never brought our dog along to a hotel but I would love to. Following you and BW and AMA. Thank you – I have done all of the steps. I would also love to see the Japanese Gardens with my family. A trip to Waterton to see the regrowth with a stop over in Lethbridge would be a nice Alberta Staycation. I have liked and tagged a few friends on fb. Entered! And love a big comfy king bed and breakfast! And I did all the bonus actions. This would be such a fun trip! All steps vompleted. Thanks Linda! Followed all 3 accounts on Instagram. When we’re travelling as a family a great pool is a must. I followed all three accounts and commented (and did all the extra entry options) I love a comfy bed with high-quality white sheets (for the gram) and bonus if it’s pup friendly. I would love to win the Lethbridge trip! It would be a grreat weekend getaway! OMG this is the best promotion and the most awesome blog yet. I read and re-read it, So full of information. Very interesting and hits so close to home for us as our small grandchildren are in Lethbridge. I already liked and loved the amazing sponsors previously, but doublechecked. I also did ALL the extra bonuses required and tagged people on facebook. I tweeted your message and love everything about this giveaway!! I followed the 3 accounts! I love hotels with sleek, modern rooms. Big bonus when there’s free breakfast and a hot tub. I follow the 3 accounts on Insta! I love hotels with sleek, modern rooms. Big bonus when there’s free breakfast and a hot tub. And speak of bonuses, I also liked AMA Travel, Best Western, and of course you on Facebook and followed you all on Twitter. I also tweeted your message and left a comment on your Facebook post. I love a good sleep, si a good bed je a must. Also location is important. I follow all accounts – teegzmum. Also on FB. This contest is awesome. I’d love to win. BW has what I look for most which is breakfast included! Instagram and Facebook entries already done. Tasks completed! And tweeted for good measure. Location and a quiet, comfortable room are key. Done the three steps! Gonna try to make sure I get the extra entries! I lived in Lethbridge for 9 months about 17 years ago but I haven’t been back in so long, would love to go. I did all bonus entries, liked all accounts on Twitter and FB, tweeted, and made a comment on FB too. Thank you. I followed all 3 accounts on Instagram. Also liked all accounts on Facebook and Twitter and did the tweet. Followed everything, hope I win! Followed the three accounts on Instagram. Clean, quiet and comfortable are musts for a perfect hotel stay! I haven’t been to Lethbridge in over 15 years & I’m sure it has changed so much. From all the pictures of the food and places you explored, it looks absolutely amazing! I love going on a random road trip or even a planned one, this looks like a fabulous city! I followed everything! I always look for a hotel with a super comfy bed! I’ve read your blog and followed all accounts. I’m excited to stay in touch with your adventures too. Hi Linda I followed all steps and love a good continental breakfast at a hotel- can’t hurt to throw in a fun water slide and hot tub too lol thanks for the giveaways love your content! A good hotel stay happens when the rooms are CLEAN!, the bedding is Crisp, and the environment is quiet. You had me at tacos and breweries! Got to check out Lethbridge! Thanks Linda! 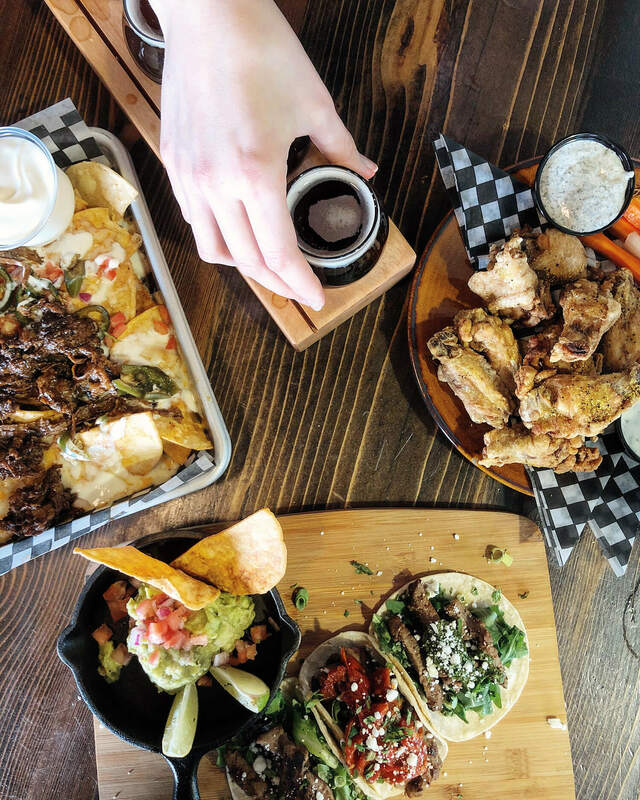 Those tacos tho…there’s some great things in Lethbridge for artists! Including a really rad artist in residence program. With having kids a swimming pool makes a great stay for us and I love rooms with a separate sitting area so I don’t have to go to bed at 8 pm. Followed everything and I hope I win! Hi! I have been following you in if for a long time – love the food posts! I have now also followed AMA and best western. A good hotel is clean and quiet! Location is important too, you want to be near the fun! Thank you for presenting this contest! I’ve followed the Instagram and Twitter steps. I would love to have the opportunity to get away for a few days! I followed all three accounts as @carschick. I think a hotel stay needs a pool for the kids and comfy beds for this mama! I follow all three accounts on twitter as @carschick. I tweeted the message and here is the link https://twitter.com/carschick/status/1063131112199737344 . Followed all 3 accounts on insta! Thanks! I FINALLY got into your blog, Linda … yay!!! Loved hearing about your short visit to Leth and so happy you enjoyed your stay. I have followed all 3 on Instagram and commented on your post. Have also liked all 3 on Facebook, have commented and shared there, and am following all 3 on Twitter as well AND have tweeted! Thanks for the chance at this awesome prize package. I followed all three instagram accounts. Great giveaway! All followed on Facebook, Twitter and Instagram – commented on IG & Tweeted! I have liked everyone on FB & Twitter, have tweeted, have tagged on FB, & my comment for the question is I look for good value in a room that is in good condition & kept clean by staff who have great customer service! Had to double check. Followed everyone, shared,commented and shared again. Fingers double crossed. Would be so amazing. I like all the accounts on instagram, and I commented on your IG post. For me, good customer service and a clean room with a comfy bed are key. Liked all 3 FB accounts! I am following all 3 twitter accounts.